Flint & Flame demonstrate at hundreds of events across the country ranging from Grand Designs to BBC Goodfood and from Dorset County Fair to the South Yorkshire Game Fair. You can find details of our appearances at upcoming shows here. We also run in-store demonstrations with our national partners such In-Toto kitchens – you can find details of these here. For more information on shows and events you can call us on 01403 740 230, email info@flintandflame.co.uk or use the form on our Contact page. 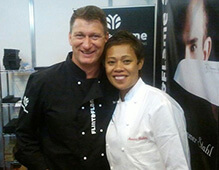 Flint and flame are rolling out some key dates where you will have a chance to meet Monica Galetti, and taste the food prepared in a cook off between Monica and Steven Edwards. This will be a fun evening but numbers are limited, so if you are interested please reserve your place as it will be on a first come bases.